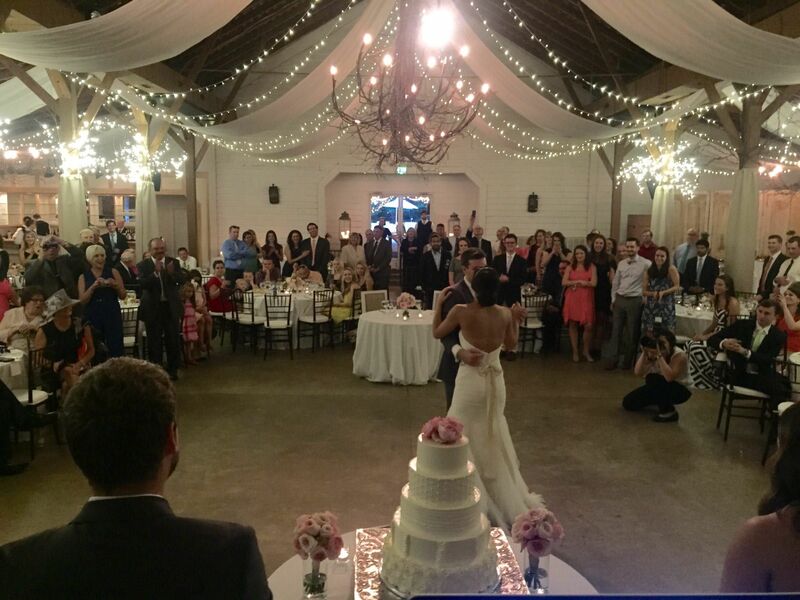 Lauren and Peter chose The Fearrington in Pittsboro NC for both their wedding ceremony and reception on what turned out to be a fantastic day! The clouds were in the air, so they chose to have the ceremony in The Fearrington’s Garden Terrace instead of the garden. It was still a beautiful service and I handled the lapel mic’s for the minister and Peter as well as a mic for readers and a blessing. After the ceremony the 200 guests made their way to the barn patio for cocktails and hors d’oeuvres. During the cocktail hour I had a mix of country, soul, standards and soft rock playing while photographer Krystal Kast took Lauren & Peter around the grounds for pics. The cocktail hour ended and guests started making their way into the barn for dinner and dancing with help from The Fearrrington’s planner extraordinaire, Gilda. I only introduced Lauren & Peter and they came in to “Isn’t She Lovely” and right to the floor for their first dance to “I Don’t Dance” by Lee Brice. They took their seats and Lauren’s father welcomed everyone followed by her Uncle Joseph blessing the meal. The food stations opened up and I continued the same mix of music as cocktails. After dinner we had toasts by the Matron Of Honor and Best Man who presented Peter with his childhood sax that was brought all the way from Ireland! So great!! It was so awesome later in the night when he actually played a solo for everyone. After the toasts Lauren danced with her father to “Give Me The Simple Life” from the movie Father Of The Bride II and Peter danced with his mother to “Days Like This” by Van Morrison. I opened the floor to everyone with “My Girl” that filled it for the next 3 hours! For some fun on the dance floor they had personalized sunglasses for everyone with neon sides and they name and wedding date printed on. It really brightened up the floor! We paused briefly for the cake cutting to “Fly Me To The Moon” and bouquet toss and garter toss to “P.Y.T.” then back to dancing to top 40 and 80’s and 90’s. I ended the night with ”Shut Up And Dance” by Walk The Moon and they had a sparkler exit. What a fun night and a great group to DJ for!!! Thank you so much Lauren & Peter and congratulations!